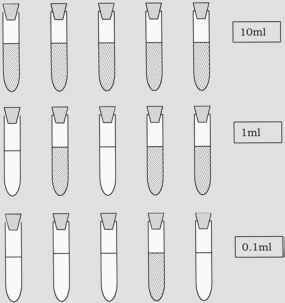 In the example below, three sets of five tubes of broth were inoculated with 10 ml, 1 ml and 0.1 ml of a water sample. The tubes were incubated to allow any bacteria present to multiply in number, and were scored as 'growth' (dark shading) or 'no growth' (no shading). The cell density statistically most likely to give rise to the result obtained (5-3-1) is then looked up on a set of MPN tables. The table (only part shown) indicates that there is a 95% probability that the sample fell within the range 40-300 cells/ml, with 110 cells/ml being the most likely value. Figure 5.3 Indirect measurement of cell numbers by turbidimetric measurements. (a) Tur-bidimetry offers an immediate estimate of bacterial density by measuring the degree to which a culture scatters light shone through it in a spectrophotometer. 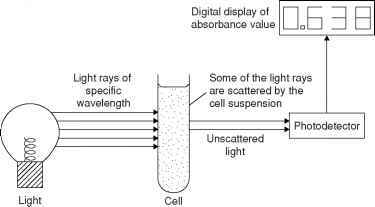 Absorbance is a measure of the amount of light scattered by the cell suspension. 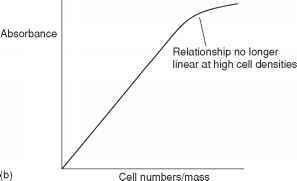 (b) Within certain limits, there is a linear relationship between cell numbers and optical density. By determining cell numbers or cell mass for samples of known optical density, a calibration graph can be produced method for doing this is based on how cloudy or turbid the liquid growth medium becomes due to bacterial growth. Turbidimetric methods measure the change in optical density or absorbance of the medium, that is, how much a beam of light is scattered by the suspended particulate matter (Figure 5.3). 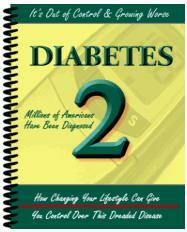 They can be carried out very quickly by placing a sample in a spectrophotometer. Values of optical density can be directly related to bacterial numbers or mass by reference to a standard calibration curve. Thus, an estimate of bacterial numbers, albeit a fairly approximate one, can be obtained almost instantaneously during an experimental procedure. Other indirect methods of measuring cell density include wet and dry weight estimations, and the measurement of cell components such as total nitrogen, protein or nucleic acid. What is MPN in microbial growth measurement? What is MPN in microbual growth measurement?